When your optic nerve senses sunlight, your body secretes serotonin — a mood-boosting neurotransmitter. In low light, your production of melatonin, a hormone that lowers body temperature and prompts drowsiness, increases. If you feel that you experience symptoms of SAD, reach out to your doctor. Until then, opt for supportive food remedies. While Winter will ignite your desire for high-fat, high-carb snacks, opt for Vitamin D-rich foods such as healthy fish (salmon, black cod and sardines). If you're averse to eating fish, fish oil with Vitamin D works in much the same way. Your body produces Vitamin D when it's exposed to direct sunlight, and Vitamin D has been shown to directly reduce the symptoms of Seasonal Affective Disorder.7 In warmer months, you'll need to focus on high Vitamin D foods or supplements if you keep covered or spend most of your time indoors. The good news is that you can request a Vitamin D blood test, through your Medical Doctor or Naturopathic Doctor, to determine your level of supplementation. With 40% of North American’s deficient in Vitamin D1 2, focus on getting a minimum of 1,000 IU per day. That said, opt to include more natural sources of Vitamin D because your specific needs could be even higher 4. 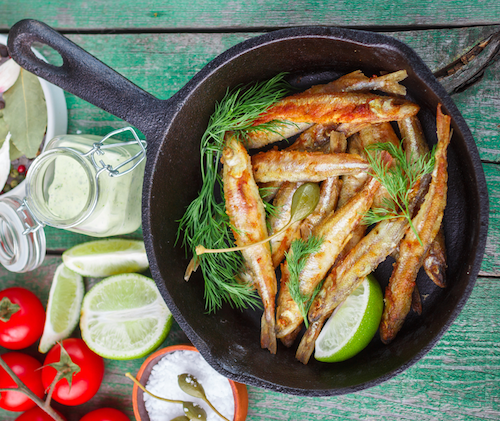 Sardines are a good source of Vitamin D as well — one serving contains 272 IU, or 45% of the RDI 10. Click here to discover my favourite Omega-3 Oil & Vitamin D supplement. One 3.5oz (100g) serving of dark mushrooms (like Shiitake) are an excellent source of Vitamin D2 with some varieties packing up to 2,300 IU— 400% of the RDI 30. 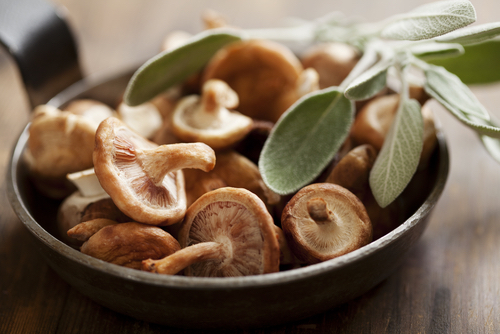 Be mindful that commercially-grown mushrooms are often grown in the dark and contain very little Vitamin D2. 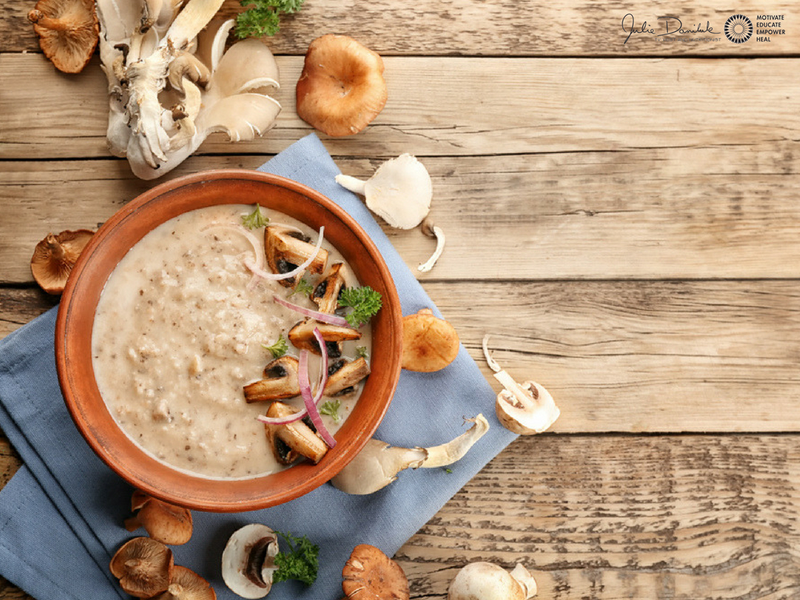 Vitamin D Hack #1 : Make Mushroom Soup! I whip up my favourite mushroom soup recipe during Canada's winter months... in just a few minutes. The ultimate energizer, coconut contains MCTs (Medium Chain Triglycerides), fats that burn like a carbohydrate.11 Coconut water-based smoothies provide electrolytes, which carry electrical charge in your body, giving you an added lift. 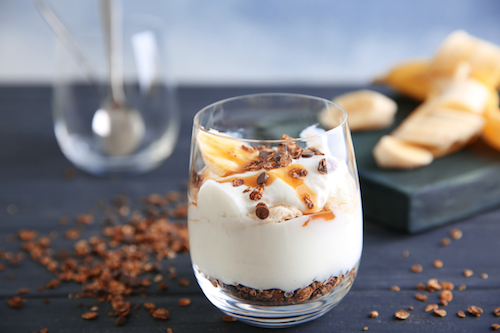 Vitamin D Hack #2: Let’s make an easy coconut yogurt parfait! Click here to discover my Coconut Yogurt Parfait recipe... adding sugar-free chocolate chips, fresh banana slices and toasted coconut flakes adds an amazing tropical flavour. Supplementing with probiotics can help reduce stress, anxiety, depression and digestive concerns – especially IBS. Vitamin D Hack #3: Upgrade your coffee! Coffee is a passionate topic for 64% of North Americans; does coffee work for you? Caffeine takes its time to work through your system – one study showed that the half-life of caffeine in healthy adults is 5.7 hours.12 This means, if you consume 200mg of caffeine at mid-day, you will still have 100mg in you at around 5:45pm. Try sticking to consuming 1 cup of coffee in the morning and then switching to kinder caffeine (tea or chocolate) later in the day. 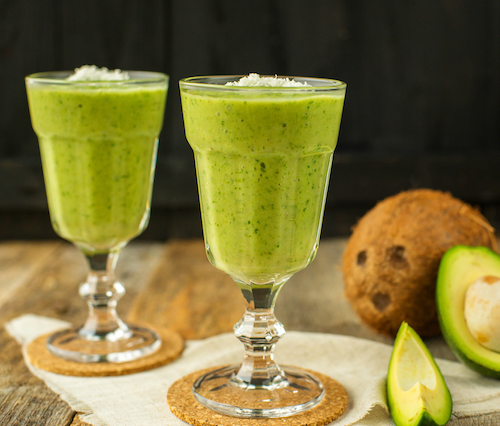 Click here for my deliciously satisfying Coffee Avocado Smoothie recipe. Did you know licorice stimulates your adrenal glands to produce more energy? Licorice actually helps your body preserve its own natural cortisone, stimulates your adrenal glands, and has antibacterial properties. Please note that licorice can raise blood pressure so, if you take this herb regularly, be monitored by your doctor to ensure health and safety. One of the best foods you can eat to increase your energy is beets. This root vegetable increases blood flow, which increases nutrient delivery to your muscles. Plus, one study has shown that distance runners were able to run 5% faster after eating beets. To make a very fast beet dip, take beetroot powder and mix it into a pre-made dip. I like to mix it into Baba Ganoush (roasted eggplant dip) or adding 1tsp to a classic bean dip to create a beautifully delicious, pretty pink dip. Click here to discover the beetroot powder brand I love! 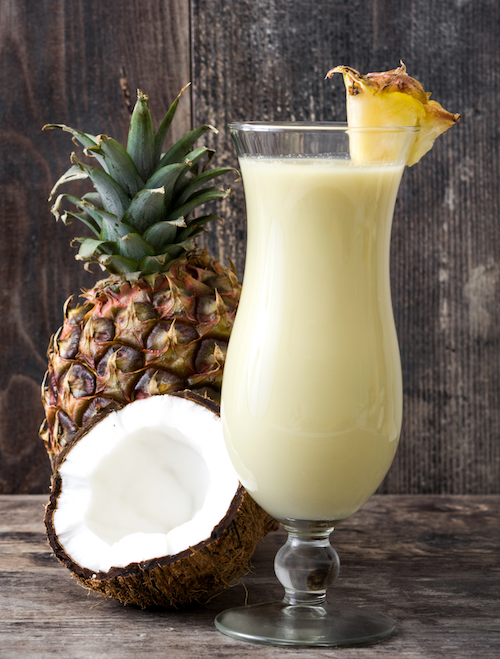 Click here to try my Maca Piña Colada recipe (it's a perfect alcohol-free party beverage to share). The ingredients in this recipe will have your adrenals so pumped, you’ll feel a smooth, natural energy “high”. By utilizing Vitamin D-rich foods throughout your winter diet, you can reduce the effects of SAD and live a happy and energized season! Quick Facts: Mental Illness and Addiction in Canada. (2009). Seasonal Affective Disorder (SAD) - Canadian Mental Health Association, Ontario Division. (2014). Pyykkönen AJ1, Isomaa B, Pesonen AK, Eriksson JG, Groop L, Tuomi T, Räikkönen K. “ Subjective sleep complaints are associated with insulin resistance in individuals without diabetes: the PPP-Botnia Study.” Diabetes Care. 2012 Nov;35(11):2271-8. doi: 10.2337/dc12-0348. Epub 2012 Jul 26. Berlin I1, Grimaldi A, Landault C, Cesselin F, Puech AJ. “ Suspected postprandial hypoglycemia is associated with beta-adrenergic hypersensitivity and emotional distress.” J Clin Endocrinol Metab. 1994 Nov;79(5):1428-33. Akash S. et al. (2013). " Improving the Vitamin D status of Vitamin D deficient adults is associated with improved mitochondrial oxidative function in skeletal muscle." The Journal of Clinical Endocrinology & Metabolism 98 (3), E509-E513. Rosenthal N. E., Genhart M., Jacobsen F.M., et al. (1987). " 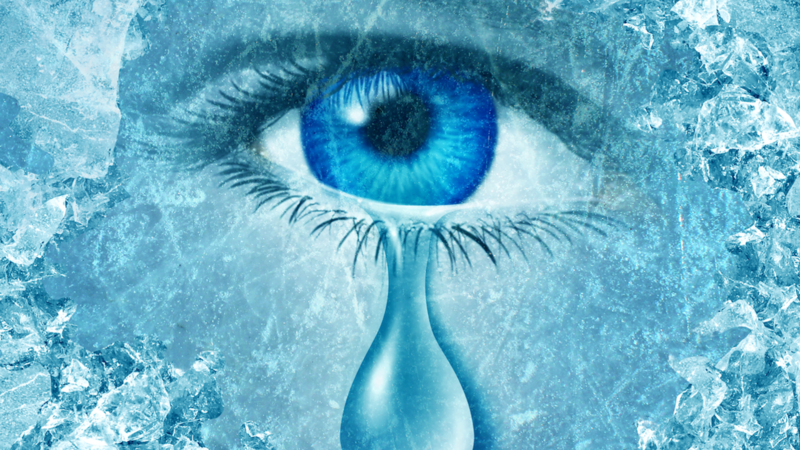 Disturbances of appetite and weight regulation in seasonal affective disorder." Annals of the New York Academy of Sciences 499, 216-230. Wagner, H., Heidrun Norr1, Munchen and Hike Winterhoff “Drugs with Adaptogenic Effects for Strengthening the powers of resistance” Munster, Zeitschrift fur Phytotherapie 13: 42-54 (1992). St.Onge M.P., Mayrsohn B., O’Keeffe M., et al. (2014). " Impact of medium and long chain triglycerides consumption on appetite and food intake in overweight men." European Journal of Clinical Nutrition, 1-7. Statland BE, Demas TJ. “ Serum caffeine half-lives. Healthy subjects vs. patients having alcoholic hepatic disease.” Am J Clin Pathol. 1980 Mar;73(3):390-3.